Yes, the summer is coming to an end, but it doesn't mean you still can't go to the beach, right? There's still time to get a glowing tan, and smell like extra crispy fried chicken? Yes, I said extra crispy fried chicken. It turns out, Kentucky Fried Chicken, or KFC as it likes to be called now, is giving away tubes of sunscreen that makes you smell like you've slathered yourself in the Colonel's secret 11 herbs and spices. Um.....I'm not so sure about this. I might want to eat myself. 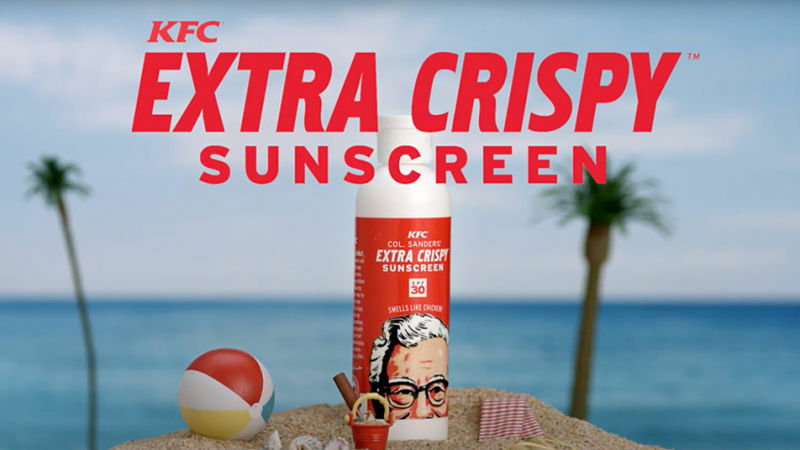 In addition to protecting its customers from the harmful effects of the sun, this bizarre promotion is clearly an effort by KFC to turn sunbathers, swimmers and everyone at the beach into walking subliminally to the food chain for the chain's fried fast food. I guess that's kind of the same tactic Abercrombie and Fitch uses to get customers into their stores. I mean come on. Every time you walk by an A&F store, all you smell is their cologne. It draws people into their stores. In one way, the idea is genius. In another way, it sounds freaking disgusting. Regardless, of how you feel about the promotion, it's not finger licking good! The sunscreen is not edible. The KFC sunscreen doesn't need to be bought or nothing has to be purchased to obtain a tube of this stuff. You just need to cough up all of your personal details like shipping address. If you miss out, you can probably have the same experience by just smearing real fried chicken grease all over your body before heading to the beach. It will also give you the opportunity to get real friendly with the local seagulls. I have to be honest. This is disgusting! But if I was going to use a food-based sunscreen, I think I might hold out for the Big Mac or Quarter Pounder with Cheese sunscreen. Or how about the Chicken McNuggets sunscreen. Now, those are sunscreens I may consider! Who am I kidding? I don't even use sunscreen. This, however, is pretty gross!